Meet Colton Powell, a senior finance major from Nashville, TN. 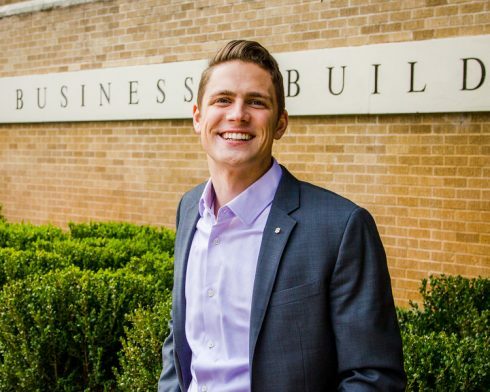 While at ACU, Colton has been a part of the Griggs Center, Collegiate Entrepreneurs Organization, the Fraternity of Galaxy, the Honors College, on the executive council for the American Enterprise Institute, and served as the Executive Treasurer of the Student Government Association. After graduation, Colton will be working for Enexor, a bioenergy startup in Nashville. Enexor is launching this summer after four years of research and development and has one of the first systems in the world that creates clean energy from waste. Colton will be working in business development for Enexor and finding clients who will benefit from their services, working closely with numbers to demonstrate how Enexor can save clients money, and expanding the business as a whole. Before moving to Nashville, Colton will spend the summer in Germany working with an investment company and staying in ACU’s villa in Leipzig. Colton will also use his time in Germany to begin working for Enexor and creating relationships with potential clients there.